World 8-1 is the first level of World 8 in Super Mario 3D Land. World 8-1 is a fort-themed level with sunset background. The level starts out in a base with some Spinies and Spiked Ball shooters. Climbing a wall, Mario will find a space with two Fuzzies, Coins and yellow Elevators, which lead to a bridge where Giant Spiked Balls roll on, and two Donut Lifts at the end of it, just before a Warp Pipe. It takes Mario to an escalator guarded by Spiked Balls and two Spinies. Above the stairs, there is the Checkpoint Flag. Ahead, there is a two-story corridor. The first one is made of Reversible Platforms and more Spiked Ball launchers. The second corridor (which can be accessed via a Brick Block), has stationary solid floor and contains some ? Blocks and also the rare ? Box. A pole and a Warp Box are seen on the far right. This Warp Box transports Mario to a long downhill protected by Spiked Ball and Giant Spiked Ball cannons. Crates difficult the transition. Reaching the end, Mario can get in either a Warp Pipe or a Cannon, as both can be used to reach the flagpole. Star Medal 1: After passing the first set of spike balls and Fuzzies, the player should hit the red ! Block to create large blocks that lead to the first medal. 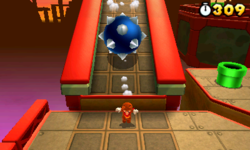 Star Medal 2: In the area with large Spiked Balls, the player should jump on top of the ledge and move along it to the second medal. Star Medal 3: Before shooting the flagpole with the cannon, the player should aim to the left and then up to find the final medal. Once the medal is found, the player must shoot to it.